iHomework 2 for iOS - Become a student superhero. 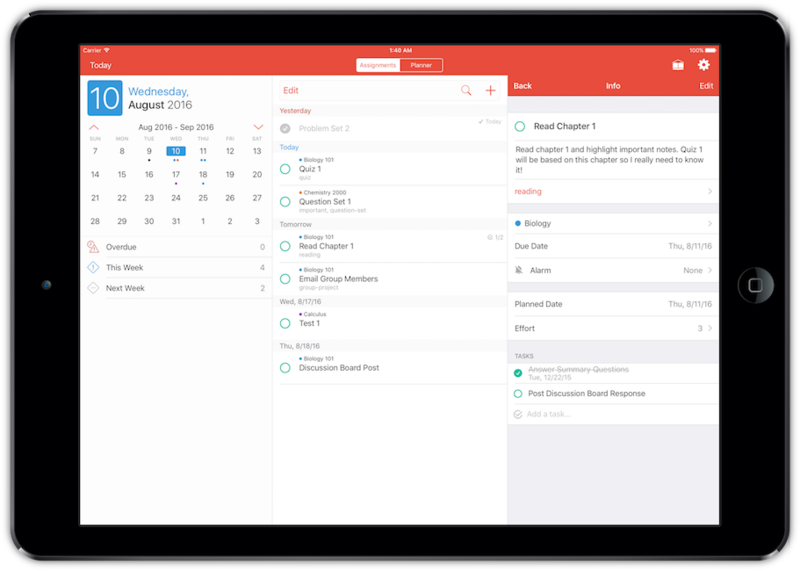 iHomework 2 is the perfect school organizer for any student. Whether on iPad, iPhone, or iPod touch, iHomework 2 is always with you on the go. No more procrastinating! The iHomework 2 Planner encourages you to start work early and not wait until the last minute. Organize and view Assignments on the day you hope to complete them - not just on the day they are due. Add your calendar events to get a full picture of what your week looks like. Record the Assignment details you need to stay ahead of the curve. Group and search Assignments by Tags or enter detailed notes so that you never turn in incomplete work. Set an Alarm to be notified in advance of an approaching deadline. Tasks are a fantastic way to break down an Assignment into smaller, actionable items. Feel the satisfaction of checking off a Task and accomplishing your goals. The Organizer is the portal to your course schedule and contacts. Have all of the Course information you need right in your pocket. Have a grading question? Quickly jump to your Course's website or check the attached syllabus without ever leaving iHomework 2. Your Instructors are pretty awesome people. Why not give them a call or send a quick email? Just don't bother them too often! With iHomework 2 for Messages, you can share Assignments directly with classmates without ever having to leave your chats. Never miss an Assignment because of a sick day. A friend can send it to you right away -- along with all those poop emojis . iHomework 2 for iOS includes an Apple Watch app and glance. Stay on track for a 4.0 GPA without ever having to take out your iPhone.